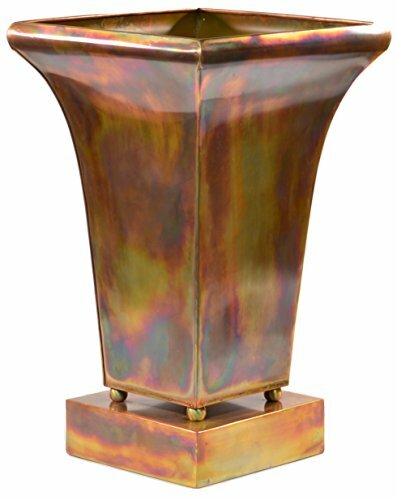 H Potter Rustic Copper finished garden planter rises gracefully to and ever-widening flared top that rounds inward. Permanently mounted atop four matching spheres on its own box platform. Stainless steel flower garden planter with a rustic copper finish no two are alike. Perfect for any location. Fantastic gift. Handmade very high quality. Stainless steel metal flower garden planter with a rustic copper hand applied finish no two are alike. Unique, hand-crafted vertical planters adorn any space indoors or outdoors.15" x 15" x 23" Will enhance your garden, patio, deck, entryway or any indoor space. Perfect for any location. Fantastic gift. Handmade item, materials are very high quality.